I just finished testing this mod and it is truly amazing! Everything works perfectly and the interior is beautiful. The moving wall and elevator are nice touches. The librarian is cool, but the armory is something to behold! I like that the open and recall spells require magicka instead of a ring or amulet. This will definitely stay in my load order. The fact that it comes with mannequins in 2 spots is very nice. I can't say enough good things about this. I think I am going to test putting one of my companions in a jail cell too, just to see what happens. I did find it a bit odd that 2 of the trainers offer the exact same training and the 3rd trainer only offers 1 different skill to train. I also have a small conflict with the Dubious's Teleport Ring mod, but I am only using that for testing mods and it won't be in my normal load order. The readme says that the mod removes a small chest on a shelf, but with the testing mod I use, the entire shelf is gone so the ring floats in the air. But again, I'm not going to use that mod for normal play. I also had some difficulty getting the elevator to work when leaving. I found that I had to approach it from the wall side instead of the stair side. Or maybe I just didn't wait long enough for it to start moving. This fits in well with the vanilla story and a quest that you need to complete anyway for the Blades. This mod is too cool! Thank you so much! I am so disappointed that I can only find one other mod of yours! And I am still looking! Maybe the readme wasn't clear but this mod does in fact remove the entire shelf. I did that because I wanted to make a little walking room to the 'secret' entrance. I just highlighted the chest because people could have had stuff in there. You can best regard the NPCs as some immersion set pieces and glorified mannequins. Congrats on a pretty cool mod! I like the story about why the safe house exists. That elevator ride is kind of freaky. 1) The sound that is played when each of the two spells are given to my character is a really really loud buzzing noise. Quite unpleasant. 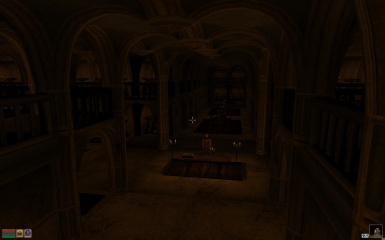 2) The library has candles all over the place which seem to be emitting light. The odd thing is that none of the candles are lit. 3) I'm seeing a lot of problems with the librarian navigating around the area. The first time I gave him a book, he went upstairs, took a turn, and promptly got stuck walking in circles for a while. After some time I looked away, at which point he managed to place the book, then went downstairs and got stuck halfway down the aisle walking in circles. I eventually gave him another book and he took off in another direction. As I follow him around, I see him get stuck occasionally, walk in a few circles, then take off again. I don't know if this happens with the Bethesda engine. 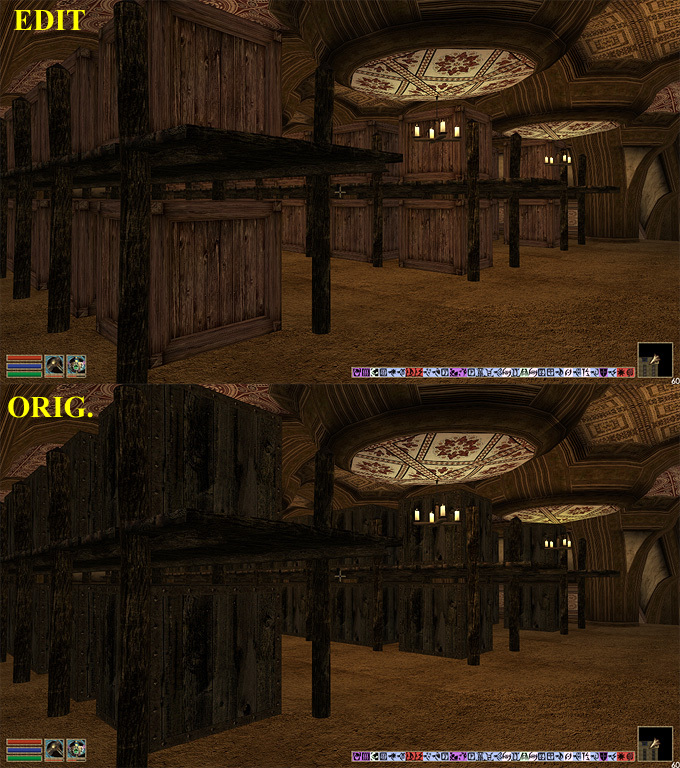 Maybe it's a pathing / collision problem or maybe it's something to do with OpenMW. 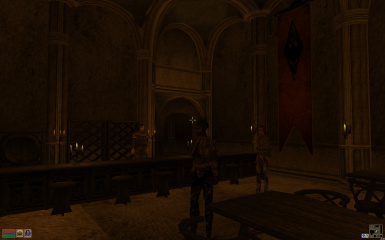 4) Most of the NPCs just stand stiffly with their arms at their sides. Do they not have any animations at all? It looks pretty weird. I'd rather see them moving at least a little bit. 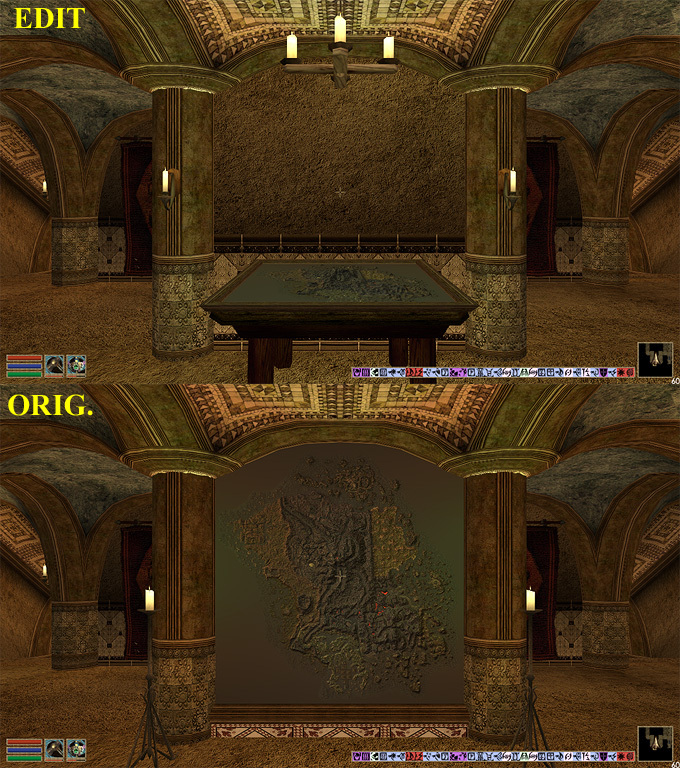 Well just don't use mods that aren't specifically for OpenMW. This mod looks great! I can't download it at the momment, but when I can, could I add some minor edits to it? Full credits given of course. Hey thanks You know my intention was for the player to fill up the place. The whole idea with the NPCs with companion share etc was for the player to gradually add stuff, including clutter, to make it feel more homely. And that would add a sense of progression. That's also partly why the lighting level is low (depending on your settings/mods), I wanted the player to at more lights where he/she wanted (the other part being that you have a sense of being underground). But I agree that idea might not be that obvious and it could maybe use a bit more 'atmosphere'. Hey, this mod is one of the best house mods I've seen. I (like others) am especially impressed with the scripting. I made a couple of minor tweaks to the mod to suit my taste and thought I might as well share it, even though I don't particularly expect many other people to be interested. 2. *^ Gives the 3d map a simplified collision mesh to prevent framerate drops when standing close to it. *You can just install the updated map mesh and ignore the rest if you want by installing the Meshes folder only. ^There is also an optional 2D version of the map included, but the only likely benefit to using it is that it's much harder to walk through it and fall into the 'void' (That is if you're NOT using my edit of the plugin. If you ARE, the 2D map will 'hang' off the table a bit because it's a longer mesh, so I recommend sticking with the 3D map). If you aren't cool with me sharing this, I'll delete this post (or you can). This mod is unspeakably cool. I don't normally like huge player houses but this one is too cool not to like. I like that it isn't free -- it always feels weird just waltzing into a huge mansion all your own straight off the boat. I like that there's NPCs in it -- big houses with no NPCs just wind up feeling lonely and weird. I like that it's empty, so I can decorate it myself and not feel silly for being a kleptomaniac picking up every plate, not that I would ever do something like that. The armor sorter and librarian are a thing of beauty, though. Thanks! Very glad you enjoy it! 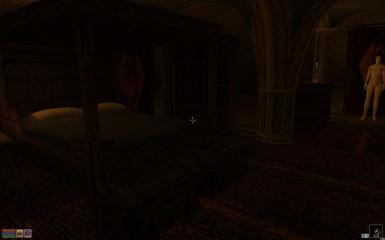 I really enjoyed this mod but some areas, like the armory, were too dark even with torches. This has to be one of the most interesting large house mods available now. The writing, scripting and interiors are top tier. The way you handled the armor/book sorters and the elevator might be the best of their kind. Framerate it good throughout, excluding the library and map mural. How is that map done? I get sub10fps if I stand right up next to it. Looks amazing though. Why didn't you put a screenshot of it on the page? I also found a few mesh issues. There's a bit of the cave mesh directly across from the top of the elevator shaft that clips through another piece of cave mesh. I didn't notice it until I had a torch out. There also appears to be a minor alignment issue under the doorway of 2 of the guest rooms. A 1 or 2 pixel gap. Hah didn't realize I could reply to this. Thanks! I updated the file and fixed the alignment issue. I think the thing you mentioned in the cave is a glitch in the mesh. If I got your location right I didn't mess with rock meshes there. 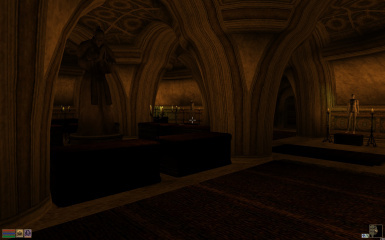 library is working in openmw, at least the librarian places the books in the room although I am not sure they are placed correctly, maybe some rotation problem here. 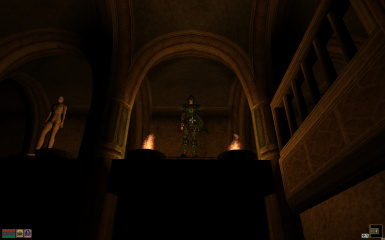 Hey, thanks for checking out my mod and thanks a lot for adding support in openmw for the scripts. The scripts are all vanilla, I'm not doing anything too weird I think. The dot is just standard vanilla and is used to access a var in another running script. 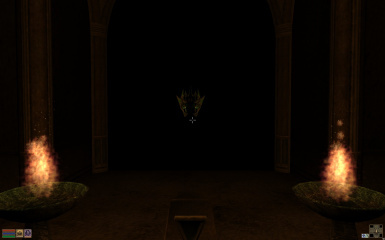 I didn't make an effort at all to get this to work in openmw tbh. I just wanted to get it done asap for the vanilla game. 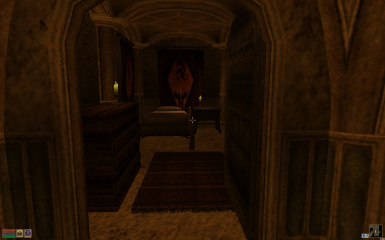 I do love openmw and, like any other Morrowind fan, I can't wait for the 1.0 version and after that what the future holds. My plan was to revisit this mod when that came out. About the books order, they are alphabetical. 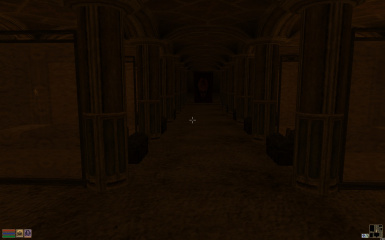 If you face the entrance (like the npc) it starts top right all the way around and then bottom right etc. There are also signs in the hallways. 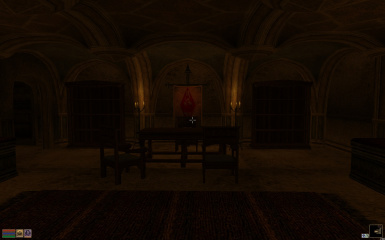 The placed books use the vanilla meshes so I left it to the player to pick their favorite texture replacers.